Ever wondered why the design you get isn’t the design you want? Concerned that the perfect message piece you have envisioned isn’t anything like what you get? So how to get the design you want? The answer is to set the design brief properly. Whether you are a designer or a client, an effective design brief is the single most critical factor in ensuring that a project is successful. You can also save money and make your marketing budgets go further by eliminating unnecessary agency fees on-the-fly modifications and author’s corrections. So how do I write a design brief? A design brief is something that is vital to any design project as it will provide the designer/agency with all the information needed to exceed your expectations. should primarily focus on the results and outcomes of the design and the business objectives of the design project. should not attempt to deal with the aesthetics of design;that is the job of the designer – don’t get a dog and bark yourself. should make these things clear before any work starts on the project. A good design brief will ensure that you get a high quality design that meets your needs, providing you have chosen the right designer. (see our guide on choosing agency). If you answer these questions below in detail, your design brief will be 90% done… the other 10% will come from further questions from the designer after you submit your brief. Tip: Never assume that the designer will know anything about your company. Be clear and concise and avoid the jargon of your business sector. What does your company / organisation do? What are the goals? Why? What is the ultimate goal of the project/campaign? Tip: You should also provide old promotional material to assist the designer. What are your target market’s demographics? ie. the age, gender, income, tastes, views, attitudes, employment, geography, lifestyle of those you want to reach. Who are your target customers, what do they read, what do they like – if you have typical customer ‘personas’ all the better. Tip: If you have multiple audiences, rank them in terms of importance. What copy needs to be included in the design? Who is providing the copy? What pictures / photographs / diagrams etc need to be used? Who is providing these? Tip: This is one of the biggest problems designers face. If they are any good they will be able to help with some of it – but expect to pay for the service. Either way, best to plan in time for this. Where is it going to be printed / used? The web, business cards, stationery, on your car, along the side of a waggon? What size is the reproduction going to be? What other information should the designer know in regards to specifications? You should provide the designer with some examples of what you consider to be effective or relevant design even if it is from your main competitors. This will set a benchmark for your designer. Provide the designer with things not to do, and styles that you do not like or wish to see in your design. This will give the designer an idea of what to avoid and will avoid disappointment on your behalf. 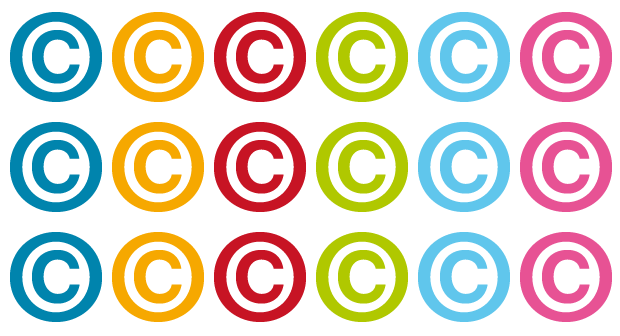 You should have a manual to hand over – or at least some logo specifications and high quality files. If you don’t have this click here to see how we can help with brand development and brand guidelines. Tip: Without guidelines any designer will struggle to know what’s on brand and what isn’t – so if you don’t have this then best to address the problem. Providing a budget prevents designers wasting valuable time and resources when trying to maximise your budget. Providing the budget upfront also allows designers to know if the project is going to be worthwhile to complete. Make sure you are worth their time. Tip: Designers ten to charge by the hour – so be aware of that and check the cost of any ‘extras’. Give the designer a realistic deadline for the completion of the work. You should take into account the various stages of the design project such as consultation, concept development, production and delivery. Tip: Rushing design jobs helps no one and mistakes can be made if a complex job is pushed through without time to review, however, there are times when a rush job is needed, and in these cases you should be honest and upfront about it. When you think about this is all common sense. Telling people what you want is the first step to getting what you want. If you don’t say what you want you tend to get what you deserve. Revised from the Public Impact blog – Aug 2014. Would you work for nothing? Would you work for nothing? We just love this video by Canadian agency Zulu Alpha Kilo. It’s funny and it sums up the kind of nonesense that we folks in the creative industries have to put up with all the time. Sadly creative industries, who base their models on time, spend real money creating pitches – you’ve seen Mad Men, haven’t you? OK maybe you haven’t, but the point is Big Advertising with money to burn create this stiuation and it suits them because it keeps everyone else out of the market. Complaining? I guess we are. But, ok then, tell us. Would YOU work for nothing? Public Impact is a Digital Marketing Agency based in Newcastle upon Tyne. We provide solutions for marketing managers and business owners want to grow their business by helping to generate more sales leads and contact through better web and social media content. 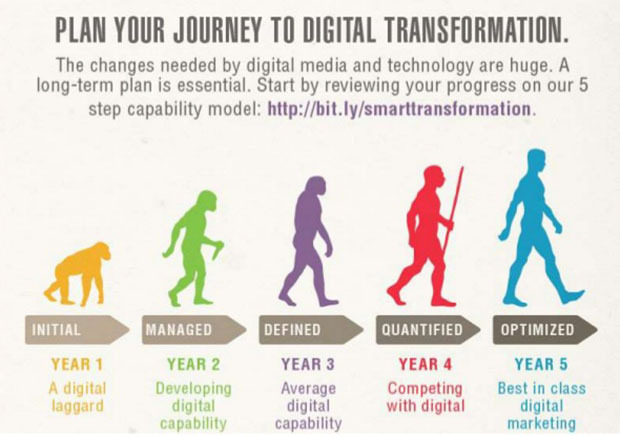 Digital marketing trends for 2016 look set to continue the long-predicted shift toward visual and audio/visual media. Figures for 2015 compiled by Lionbridge for the Content Marketing Institute and eMarketer show a significant increase in the use of visually-based social media for the distribution and promotion of content. In particular the survey indicates that the proportion of content marketers using Instagram has almost doubled from 2013 – by far the biggest proportional increase. While some of this reflects consolidation within social media the bulk of the increase, as this blog predicted some time ago, is also because of the major brands now regarding Instagram as a serious and effective channel for brand promotion alongside the growth of the network under the ownership of Facebook since 2012. Go behind the figures, however, and an even more fundamental trend is pushing these figures. 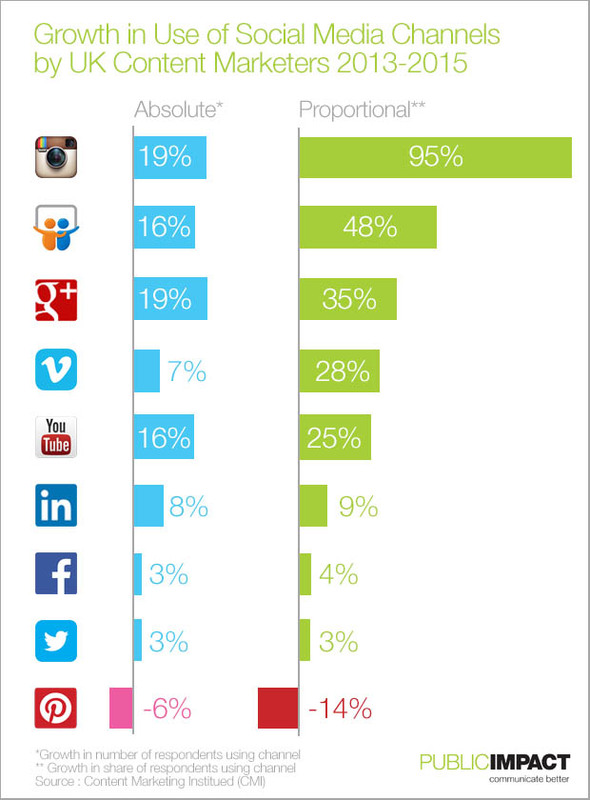 Instagram has always been primarily a mobile medium. It’s no surprise then that it should grow and be seen as more important by marketers as mobile devices account for an ever larger share of internet access. The continued growth in the use of YouTube and, to a lesser extent Vimeo is in line with the desire to engage through video content. 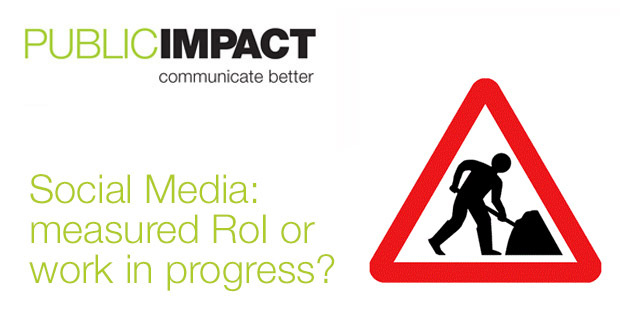 However, while more people are using video there remain serious questions about how well they are using the medium. The overwhelming majority of self-produced video content deployed on the internet remains virtually unwatchable. Webinars have the same problem. The significant growth in SlideShare – acquired by LinkedIn some time ago is hardly surprising. Sticking to the devil you know, the PowerPoint deck, offers an achievable means of distributing content with a minimal learning curve. Pinterest, where the user really needs to search and seek out content rather than have it offered on a feed, offers a more haphazard channel an one that seems altogether more difficult to measure – as marketers seem to be discovering. Pinterest seems set to remain ‘niche’. As for the other networks, the level of use of Twitter and Facebook means there is only one way to go – and we should expect a decline at some point as marketers, still experimenting with social media refine their mix of channels. Google plus, however, continues to grow despite its change in direction, its usefulness in assisting search being central to its appeal. However Public Impact’s experience talking to businesses using social media in Newcastle upon Tyne and in Berkshire suggests that there is a long way to go before UK businesses and not for profit organisations use content marketing and social media marketing to their full potential. Digital marketing is nothing if it isn’t visual. Getting better results from social media posts and ensuring that web site content produces sales leads are projects considerably aided by effective visuals. We’ve been looking at the simple points make by standout 2015 infographics. Looking around visuals in 2015 a few have stuck in my mind and illustrate nicely some of the key points about more effective infographics (all copyrights acknowledged – in praise of the work of others – see links as appropriate). A little cruel this one but it gets the point across nicely – it takes longer to get digital marketing up to speed than you think. The strong, unified single image and strong headline makes an instant point that draws you toward the detail. Not sure the five year timescale is valid, but the main point stands. 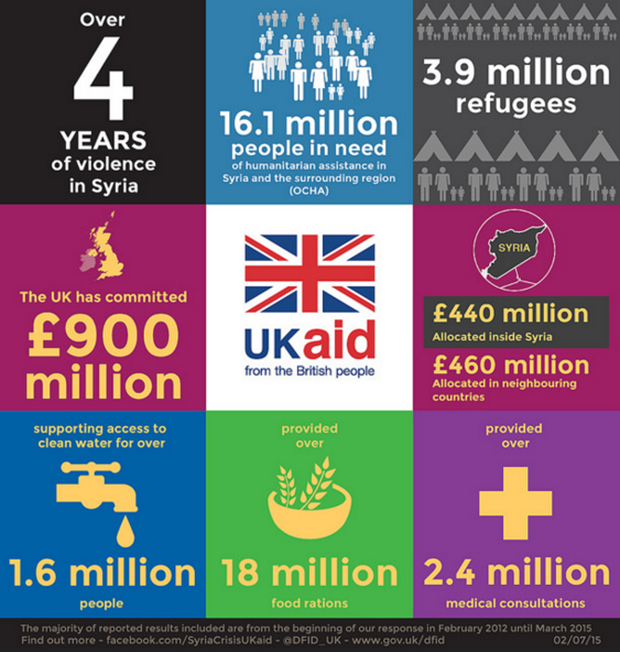 This image from The UK Government Department for International Development (DfID) spells out the facts of aid from the UK to Syria since the crisis began in 2012 in a series of stark images. The image presents as simple and truthful without making judgements. Like all facts they have a context – and they are the starting point of discussion. So much easier when there is clarity and a logical reading order. Have a look at the points we make here about not-for-profit infographics. Local Authority budgets are the stuff of sleepless nights for some and for the rest a cure to insomnia. Councils do a lot and deliver a lot – and it’s hard to take in. 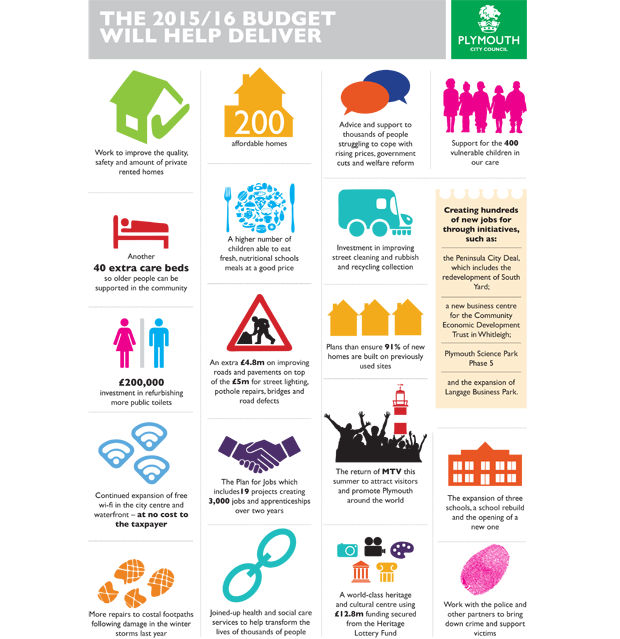 Plymouth City Council produced a excellent series of infographics to put across the scope of their budget using simple graphics on a clean background. Make a dry subject come alive with vibrant colour. The Oscars have a reputation for playing safe and ‘The Academy’ is often dreadfully predictable. 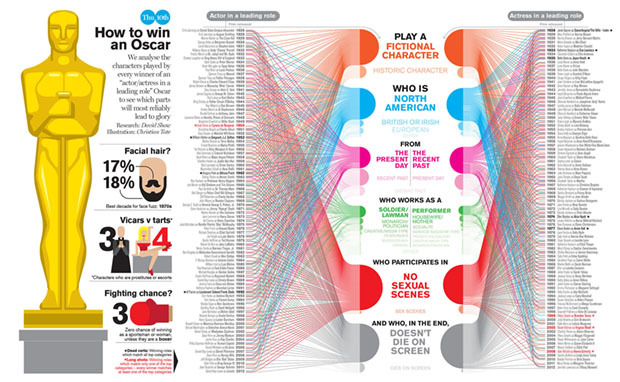 Apparently this is how to win an Oscar if you are a lead actor. Simples. The hard part, of course, is becoming the lead actor in the first place. The detail is impossible to see but that’s not the point – it’s the aggregation that’s important – an if you are really interested you can find the full size version on the link here. This one is interesting. Who thinks listening to music helps their driving. I see a lot of virtual hands in the cyber air there. Wrong, probably. This one give some of the facts, seeks to educate, conveys lots of complex information but leaves out some essential facts. Like how on earth could it be that listening to Coldplay could possibly help anyone do anything? Blogging is a fantastic tool for NGOs, charities and not-for-profit organisations. So why are so few UK not-for-profit organisations using it effectively? Analysis of the UK’s top charities reveals that only a small minority are using their blogs to maximum effect. Blogging is an excellent way for NGOs, charities and not for profit organisations to engage new supporters and to raise the profile of the organisation on the web. Blogs get found by search engines and though the largest non-profits will be found easily through name recognition and direct search their home page won’t necessarily hold the information that the viewer is looking for. So even for the largest NGOs not to have a blog that engages supporters is a missed opportunity. But true as that is how much more important is that to the next tier? Small and medium sized not-for-profits have the most to gain from writing a better blog. Non-profit SMEs don’t have the pull of a household name, a massive research cause or a big TV ad campaign to support them – so they need to be found online and a well written, well promoted blog is one of the most cost-effective ways to get found. BUT REMEMBER – running a blog take time and resources – most of all IT ISN’T FREE. So think it through before you start. Here are ten easy ways to write better not-for-profit blogs and to use blogging to get more supporters and donors for your charity. People love lists, the web loves lists but most important of all people search for lists. So ‘ten things you must know about your cause’ is always a great starting point for a blog post. Will they include search keywords? Will they get a message across that the article matters? Do they accurately describe what the article is about? bullet points that make information easy to read. Online articles need pace and space. As well as a structure that makes it easy to scan your article quickly keep your sentences short. Think carefully about how you use paragraphs. While it may not be entirely correct to use three short paragraphs when you might use one in print it will make the piece more readable. Blogs are not just words. They can be infographics, collections of images, animations, sound files or video. All these things help the mix and keep it interesting for your readers. Remember too that every blog should have an image because images are found by search engines too. Every profession has its lingua franca and every organisation has its jargon. Do yourself a favour and drop it – or at least keep it out of your blog. Why? Because it’s not about YOU. It’s about your potential supporters and they speak English! (or they speak French, or Spanish – but the same point holds – they don’t speak your jargon). Writing about something that’s in the news right now is great – but it’s not always possible. Even so taking a peg of some sort from the news and hanging older content onto it is an excellent way to produce new blogs from old, making work that you have already done relevant to a new audience. Also not for profit websites are stacked full of information that can easily be turned into a blog and hung on news or current events. Dry content that presents facts is all very well but especially in non-profit writing it is good to make blog stories about the real world. So include examples, user stories and anecdotes. In fact they are sometimesthe anecdote can be the inspiration for the whole blog. Non-profit blogs need to be varied and present their information in many different ways but remember that viewers become supporters, supporters become members and sympathisers become donors because they understand exactly what you do and the difference that their contribution can make to something they care about. That’s why your mission has to be part of what your blog is all about. This is where most non-profit blogs fail. They tell an interesting story, they point out how important it all is and then they fail to ask the reader to do anything – whether it is to donate, join or sign a petition. A blog without a call to action is not worthless but it belongs in the academic world or the media – In non-profit it is a missed opportunity. An audit of the blogging efforts of the UK’s leading charities reveals that more than half are either dormant, poorly updated, unfocussed and, inevitably, failing to deliver the potential that blogging can offer not for profit organisation. If you think this is a questionable assertion then go look for yourself. You will find blogs that are hidden away in the depths of websites, blogs that have no obvious purpose, blogs that masquerade as ‘news’ pages and, worst, blogs that are not there at all. Of course there are excellent examples of good blogging practice for not-for-profits but it is worth asking yourself how did so many otherwise excellent organisations get to this pass? What are the worst reasons for not-for-profit blogging? Why does a not-for-profit blog become out-of-date? Why don’t people know what to write in a not-for-profit blog? 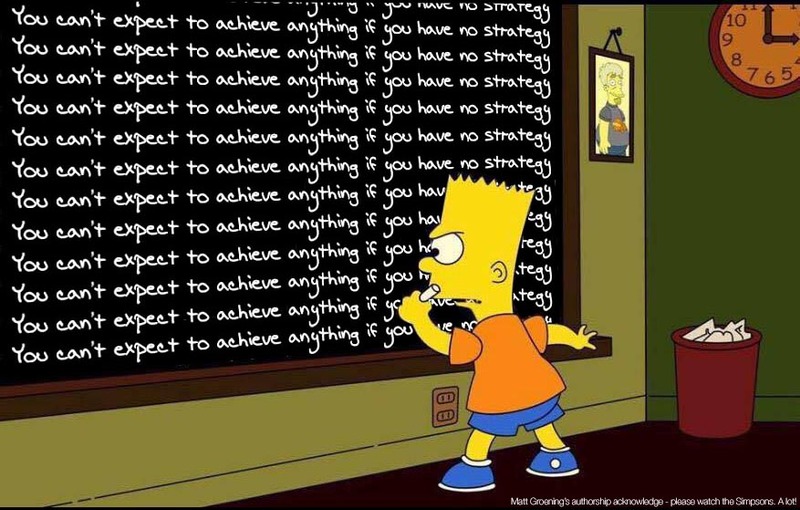 So often this goes back to why the blog was set up in the first place and, as with much in marketing and communications, a consequential failure of strategy. The uncomfortable fact is quite a number of organisations haven’t any real idea how they ended up with a blog in the first place. The reality is when they last renewed or refreshed their website they were told by theweb designers that having a blog was a good idea and they ‘threw it in’ with the rest of the job or it was justanother of the bells and whistles in the webco’s sales pitch. There may even have been a justification of the benefits a having a blog are for a not for profit bring, but no idea of where it meshed with the organisation’s strategy or how they would manage a blog. When I was younger my late mother desperately wanted a hostess trolley. She didn’t entertain and there were only the three of us – so she had no ‘core business requirement’ for a hostess trolley. The only reason she wanted one is because “everyone else is getting one” – or so she thought. Fashion is a powerful thing. And so it was with blogs, ‘they’ve got one, so we should get one’, though the purpose was less than clear. My mother used her hostess trolley about twice in 30 plus years. Is your blog a hostess trolley? I never cease to be amazed by managers who are prepared to hand over emerging communications trends to interns. It’s usually because they can’t be bothered to learn themselves. One manager told me ‘we didn’t know anything about it, so we gave it to the intern and when she left nobody kept it up’. It’s more common than you think. Managers and leaders are busy people but part of leadership is understanding the importance of emerging trends and where they fit into a strategy. “We heard you could sell advertising on a blog, but it didn’t produce anything”, is something else I was told. Of course this not-for-profit leader was quite right – a well-run, popular blog with the right amount of traffic can carry advertising – but if that is the prime motivation then failure awaits. It takes a lot of work to establish a level of traffic that will produce significant advertising income and that’s before you consider the complications that carrying advertising presents for not-for-profits. Don’t dismiss the possibility of advertising income but it has to be viewed as a bonus. Effective blogging for not-for-profit can improve engagement with supporters, produce more donations and provide a means through which new clients can find your organisation. But blogging is a medium to long term strategy through which results will be produced over months and years rather than in days and weeks.Seeing the process as a ‘quick win’ is a mistake – it will lead to disillusionment and to another neglected or abandoned blog. Go into the process with the right expectations and you are more likely to succeed. Tell your stories that show how you make a difference. Supporters, volunteers and donors want to make a difference and your blog gives you a productive and interactive means of not only broadcasting but receiving, learning more about your audience and in doing so establishing your authority in your chosen segment as well as building better search engine results in the areas your audience cares about. All of these things will only come about if the blog is at the heart of your digital strategy and becomes part of your communications plan. If it isn’t there right now, it’s time to revisit. Content marketing is a powerful and growing trend for all kinds of businesses on the web. Forward looking marketing professionals are getting a great return on investment from their efforts. The key trend is toward greater creativity in the propositions that engage your audience over the web, build the personality of your organisation and meet the customer, supporter or collaborator in the online space they frequent. 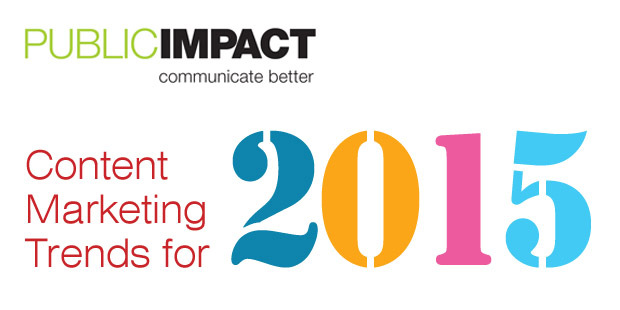 Here are 10 content marketing trends for 2015 to consider when planning the year ahead. Branded sketch video content and comic animation has been an increasing trend in TV advertising for many years – some of it quite strange, some of it not actually funny but some of it stella. In the modern world it’s not beyond you. Key Tip – follow the genre rules and remember the script is everything. It doesn’t matter how serious your subject there is an alternative angle that grabs attention. Open up. Bring in your partners to write for you, host your suppliers work – you’re bringing business their way after all. Show you are part of something bigger. Open the opportunities to yourself to return the favour. It’s good SEO too. Content that is easily and quickly shared through social media, in particular through Twitter and Linkedin but also through Instagram and other networks not so typically associated with business and brands but where customers nonetheless live online. Clips, vlogs, stories, interview. If it moves it’s growing massively across the web. You don’t need to be left out. Follow the most important rules of the genre: keep it short, open with impact, learn how to do a soundbite, get the light right, edit and remember it’s the sound that let’s you down. The bigger brands continue to develop their web experiences (in which we include for the sake of space/time and pedantry mobile apps) to fit the customer/viewer. Being able to return to where you left off, to be able to input your sizes and push-notify possible products was once the stuff of only the biggest, but as ever technology trends put personalisation in reach of smaller players. As traditional news media implode and paper publishers panic the barrier to entry inhibiting niche media are lowered. There’s a niche publisher out there presenting the stories you value. Interacting with them can bring you traffic, interest and credibility. Showing people how to use the products you produce, showing potential customers how users have got a return on their investment or building an episodic marketing campaign that build awareness and web traffic – it’s all stronger when it is visual and cross-media. It’s becoming more practical than ever to punch above your weight with smart use of cost-effective technology. All you have to do to start is to see yourself that way. You have expertise so be an expert and connect with your customers by providing something useful – less hard-sell, more value-added and credible. People like quizzes. People like surveys. People love games. OK, not everybody, but most of us who live online will admit to enjoying at least some of this stuff. The tools to create interactive content are more accessible than ever. Find like-minded bloggers, exchange direct links and create a larger audience. It’s been around for a long time but it still works and enhances both your credibility and your SEO efforts. Maybe you can’t do all of these things, but you can certainly do some. Public Impact can advise on what tactics are best for you, what it should cost and how to best manage your content programmes. On global trend that is sure to continue is the move toward mobile computing through smartphone, tablets and phablets, so as well as checking out the trends above get the basics right and maker sure your website performs well on multiple platforms by implementing responsive web design.